HYALURON CLINIC range is based on the synergistic action of PRO-VITAMIN B5 and five forms of hyaluronic acid: 10% LAB HYALURON, cross-linked hyaluronic acid, volumizing HA microspheres, GLYCOHYAL LW and PatcH2O. Together they form a three-dimensional skin tightening matrix, ensuring the effect of GLOBAL REJUVENATION. 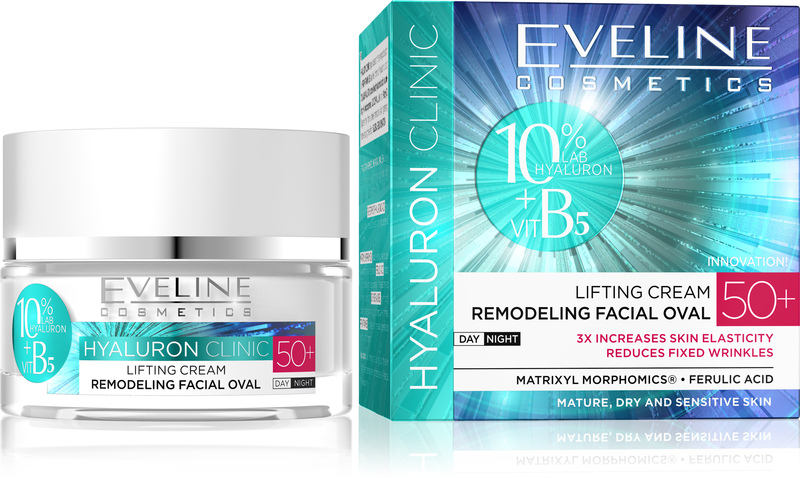 LIFTING CREAM REMODELING FACIAL OVAL 50+ ensures the effect of radical skin rejuvenation through a multidirectionalf process improving skin condition:f Combination of FIVE FORMS OF HYALURONIC ACID provides skin with an increased dose of moisture and restores its silky softness. MATRIXYL MORPHOMICS® reduces vertical wrinkles responsible for the aged skin appearance. FERULIC ACID protects against photoageing, repairs damage in the epidermis and minimises discoloration. SOY ISOFLAVONES, by stimulating collagen and elastin synthesis, lift and improve skin firmness. PRO-VITAMIN B5 stimulates epidermis renewal, regenerates and restores youthful radiance. Application: every morning and evening apply the cream onto the cleansed face, neck and décolleté skin. Perfect as a make-up primer.